Do Dogs Have Nine Lives? Playsilks for Boys :: Youbetcha! Advent is a season of waiting... as we journey into the darkest time of the year and our longest nights (in this part of the world, anyway!) we feel deeply the need for light and hope. For Christians (walking in the shoes of many before themselves as the dating of Christmas was strategically aligned with the winter solstice!) we wait in the duality of the faith that Christ has come and will come again to bring light and hope and culmination. At our house we celebrate the birth of Christ with our Angel Calendar. But, of course, this idea of bringing of light is much older than Christ and Christian calendars, and it resonates in festivals and observances throughout the world and across many faiths. We are, as people, united in our waiting sesaon. So, however you celebrate, there is that anticipation, that counting down, towards celebration. Last year I created a natural calender for the season, made in the Waldorf tradition. And no, it doesn't include chocolate or little doors, sorry! What is it? It consists of a silk banner hand painted with 25 stars. I debated sticking to the Christian season of 28+ days, but that gets too complicated! So 25 days of December it is. The banner is 5 feet long and 11" wide. 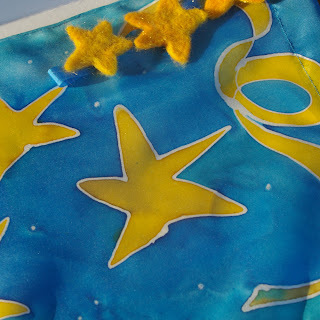 It is embellished with a trio of needlefelted golden stars attached to hand dyed silk ribbon and hung on a twig (you may choose to substitute a dowel, or choose your own twig). 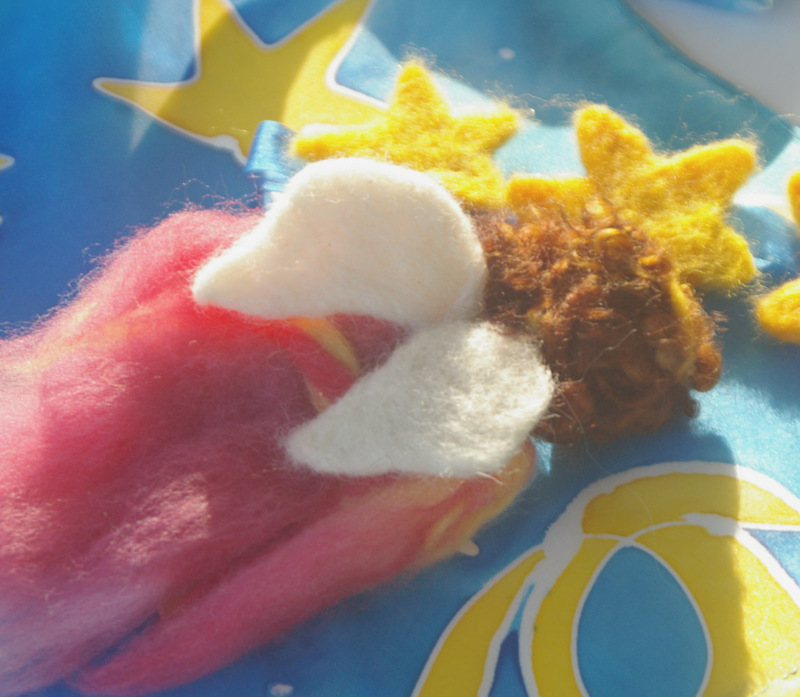 The angel is made of wool, needlefelted softly for an ethereal finish. How to use it? The banner is hung. You may choose to have the bottom land on a nature table, Nativity scene or other seasonal space where a candle waits to be lit. The angel (from the Greek angelos 'messenger') begins on the topmost star on December 1st. 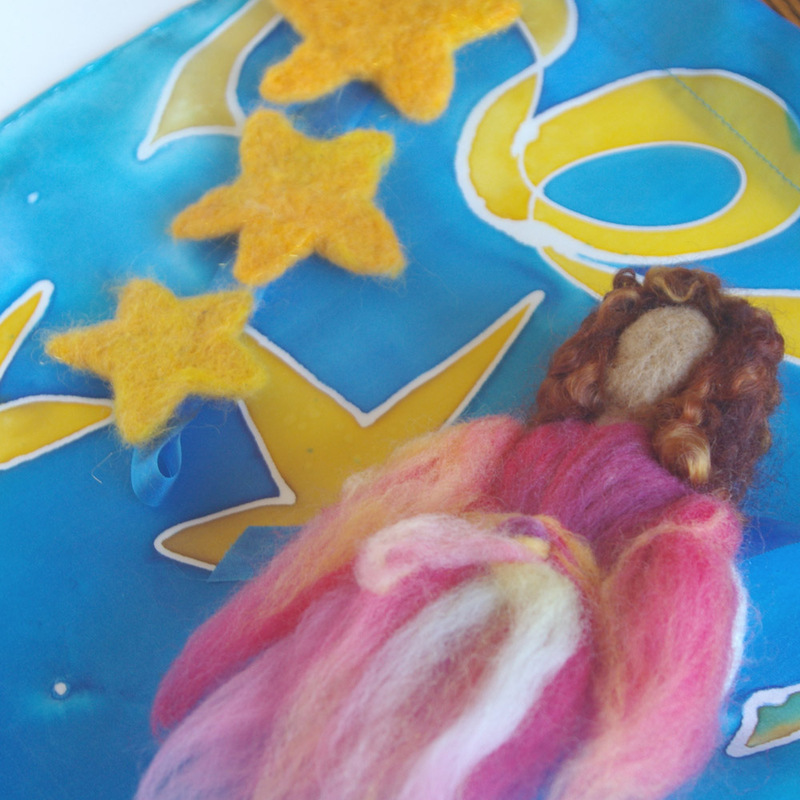 Each day she journeys one star closer to the bottom with her message of hope and light. When she reaches the final star, on Christmas Day (or whatever other festival you may choose to adapt her for! ), the candle is lit (not too close to the banner!) and the celebration begins. As I find that folks like to choose both the dress and hair colour of their angel, I have created a customizable listing in our Etsy Shop. This saves me having to do an angel hair-ectomy as I did last year to make a brunette into a blonde! Oh I love it! Really beautifully done. We don't give gifts nor chocolate for the days of advent so this is PERFECT! That is so beautiful! And how original. I love this! I want to do a advent now that my boys are 1 and 3. Such a beautiful Advent calendar!! It is funny because I just wrote to you (etsy) and mentioned the Mary figure I am going to make and it is actually to go with the star path I am going to make, and just today I was thinking of the yellow and gold wools we have to needle felt so many stars. I love your star path!